Cat Eye is considered to be one of the most hyped and requested eye makeup look in any makeover routine. Many of us who have already embraced the look find it very dramatic, glamorous and chic. A cat eye may turn out to be a beginner’s worst nightmare but if executed the right way it can actually add life to the whole look! Yes! There is no shortcut. It takes time, patience and experimentation to master your flicks. It’s almost impossible to draw the perfect flick the first time and even if you do, the chances are that you would not be able to replicate it on the other eye. Sad story. The good news is that if you follow the below instructions carefully, you might be able to master it in a shorter time span. And The Best Eyeliner Is? The cosmetic giants and drugstore brands have bombarded the market with so many types and perfectly packaged eyeliners and eyeliner stencils that it has become an arduous task for a beginner to select the right one. In our opinion Gel eyeliners and liquid eyeliners are the best options for a cat eye. 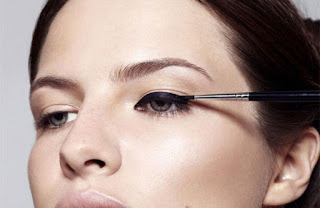 Gel eye were initially introduced in the form of pots with eyeliner brushes but brands like Beth Bender Beauty, COLOUR POP, Urban Decay, E.L.F and NARS have come up with eyeliner in simple/retractable forms as well. Though the pencil has its own use but it wouldn’t be a smart choice for a cat eye as you need pixel point tip for making precise lines. The most ideal products would be either a liquid liner pen or a gel eyeliner used with an eyeliner brush. A Precise line is the most essential element of a perfect cat eye and with the perfect brush anyone can create it on their eyes. There are a variety of designs and shapes available and different MUA recommend different ones but don’t be scared you can use anyone you like given the brushes are of high quality. There is a precision brush, an angled brush, a bent eyeliner brush and gel eyeliner brush available in the market. The precision and gel eyeliner brushes are known for their sharp and pixel pointed tips which are perfect for drawing a naturally thin line and for creating thin flicks. An angled eyeliner on the other hand is best suited for drawing the perfectly angled wings. Practice! See what you like best! Shape and Thickness of Wing? The ideal cat eye does not have the same width across the eyelid. It starts off with a thin line from the inner corner of the eyes which gradually gets thicker towards the end. Remember the semi-circle drawn on your eyelids look like a gradual arch. Of course once you have drawn the arch you can always work on its thickness as you like but remember the gradient has to be maintained! NEVER Stretch your Skin While Drawing! Stretching your skin? Sounds Familiar? Many of us are in the habit of pulling our skin tighter in an attempt to make our lines easily but those of us who have tried it would know that every time you did it your winged liner became a catastrophe! Draw your lines as naturally as possible without stretching your skin because otherwise when you release your skin it creates weird patterns that resemble nothing like a cat eye. It is very crucial that you get your angles right. The best possible way is to hold a brush from the side of your nose and join the outer corner of the eye and the end point of your eyebrows on its way up. This will give you the perfect angle that will suit your face; after all there is nothing worse than un even angles in cat eye makeup! Jennifer is a fashion stylist, and a brand ambassador of eye makeup brand. With a vast experience in beauty tools and accessories design, she turned into the creative side and has been named as one of the top fashion blogger. Mountain is in her heart - a passion for mountain climbing. Thank you Jennifer for the fantastic guest post! If you would like to write a guest post for Beautifinous, please don't hesitate to get in touch!